The tiled entryway in my apartment is a mess. It seems the floor beneath it wasn’t leveled so all the tiles are cracking and breaking and I’ve sliced open my foot a couple times. I am scared of my landlord’s aesthetics, so I want to beat him to the punch and install my own floor. Any tips on tiling in a small space? How to know I’ve made the base level? Where to find cool, inexpensive tiles? Guidance of any sort would be greatly appreciated. Thank you! Making sure the floor is level. The first thing you’ll need to do after you get all of the old tiles removed is make sure the subfloor is sound. If your subfloor flexes, it needs to be reinforced before you do anything else, or “laceration alley” will come back to haunt you. 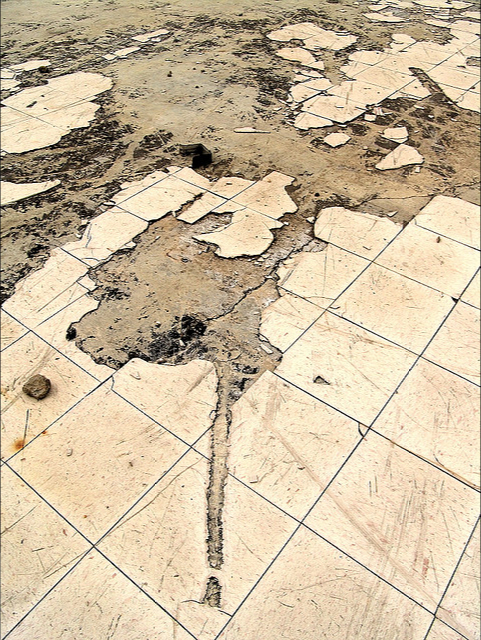 A solid but uneven floor can be dealt with by applying a floor leveling compound. I like Ardex Feather Finish, but there are a bunch of them out there that will probably work just as well, Laticrete “LatiLevel” and Henry Feather Finish, to name a couple. Pick one that is appropriate for your subfloor and read the specs and instructions like your life depends on it. Give the subfloor a good scrape-down, then shine a flashlight across the surface of the floor – bumps will identify themselves by casting shadows and you can scrape or sand as necessary. Sweep, vacuum, and wipe it clean with a damp sponge. Now you’ll need to identify the hills and valleys. One way to do this is to run your ear along the floor, wherever you hear “The Sound of Music” is a hill; wherever you hear “gag me with a spoon” is a valley. Another way is to drag a straight-edge over the floor and look for gaps. Circle the low spots with a pencil so you’ll know where to concentrate the compound. Apply the leveling compound as directed (some require a coat of special primer first,) but keep in mind that it sets up really fast so you will have to be on your A-game. Best not to attempt this while hung-over or hungry. You may want to mix up a few smaller batches as opposed to one big one. Mix with a paddle attachment on your drill, using really cold water, until you get the right consistency. Then pour it into the valleys, and smooth it out using a flat trowel like this one. Do the math, making sure to include the grout joints in your calculations, so that you don’t end up with an awkward looking row of sliver-thin cut tiles on any edge. Then, do the math again. You’ll benefit from the confidence that comes from double checking. And always, always make sure to do a “dry run” of the layout, including the spaces between tiles, before you start gluing them down so that you can see how it’ll look and anticipate any hang-ups. Since “cool” is in the eye of the beholder, I don’t have a magic recipe for this. But since you are only tiling a small space you’ll have a lot more options. In my experience, the cool inexpensive tiles I’ve found have all been left-over stock of discontinued styles from local small-town tile distributers. But I mean, waaaay left-over, like 30+ years. You can get inexpensive tiles from the big box home warehouse stores and make a cool pattern with them. Or you can do a little detective work in the industrial sectors of smaller cities. If you go that route, be sure to pick their brains about your project too as they’re usually staffed by very knowledgable and helpful pros. Whatever you do, make sure you get actual floor tiles, they’re thicker and sturdier than wall tiles, and get 10 to 20 percent extra to allow for mistakes and replacements.